Mt. 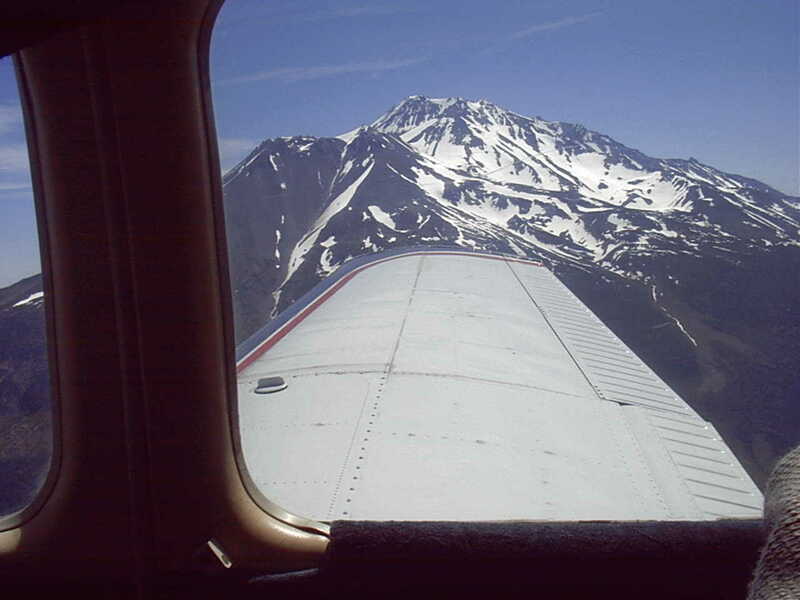 Shasta as seen from the northwest from a small plane on June 20, 2002 (left) - this gives you a good idea of typical snow cover near the end of June. You can see Lake Helen and Red Banks towards the right of the picture (click on the picture for a magnified view). Mt. Shasta from a distance (middle). Mt. Shasta as seen from the parking lot at Bunny Flat in June 1993 (right). This is where you begin the climb. Bunny Flat, Climber's Gully, Lake Helen, Avalanche gulch, Red Banks, and Thumb Rock are all on the main route and are visible in this picture. Mt. 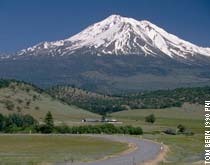 Shasta is located on the east side of I-5 in the northern part of California about 40 miles south of the Oregon border. (See maps for more detail.) Mt Shasta is part of the volcanically active Cascade Range and is one of the many volcanos in California - Medicine Lake, Lassen Peak (Mt. Lassen) and Long Valley Caldera (Mammoth Mt.) being the other most notable peaks. Shasta stands 14,162 feet high and is the home to 5 glaciers. For more information on volcanos in general try The USGS Mount Shasta Links Page or The Electronic Volcano. A few years back (around 1992) I decided that I wanted to do something challenging and exciting in the great outdoors. After reading various articles, books, and maps I decided that climbing Mt. Shasta was just the ticket. The area is beautiful, the mountain is impressive, and it's far from the main population areas of the state. My first chance to attempt the mountain was in 1993 when a group of folks from Cisco asked if I'd like to join them on a climb that summer. I have been back to the mountain every year since and I have also taken the time to explore other wonders in the greater Shasta area, such as: Lake Shasta, Shasta Dam, Shasta Caverns, The Blue Goose steam train in Yreka, etc. I would recommend the entire area to anyone who loves the great outdoors. There are a number of different routes up Mt Shasta but there is basically one main route called the Avalanche Gulch Route. The other routes are for more experienced climbers and account for only a small percentage of those going to the mountain. My experience and information is limited to the Avalanche Gulch Route, which is on the south side and starts from Bunny Flat. There seem to be two different basic approaches via this route: either do the entire trip in one day or do it in two or three days staying overnight at Horse Camp, Lake Helen, or both. The one-day approach makes for a long day and packs a lot of elevation change with little time to acclimate. But, on the positive side, there is less gear to rent and haul up the mountain than if you were to stay overnight. You will also avoid the less than optimal campsite conditions at Lake Helen. The two or three approach gives you more time overall to make it up and back down the mountain. But, you must carry more gear with you than the one-day approach. In particular, you need to add a tent, sleeping bag, bedding pad, extra food, extra water, extra clothes, etc. This all adds up to quite a few pounds. There is also the issue of setting up camp at Horse Camp or Lake Helen and trying to actually get some sleep so that you are ready for the big climb the next morning. Your success probably depends on your experience setting up a tent in the snow and on how soundly you sleep. No matter which approach you choose you will most likely stay overnight somewhere in the Mount Shasta area so that you can be on the trailhead early in the morning. Some people choose to stay overnight at Bunny Flat, either in a motorhome/camper or in a tent pitched in one of the areas nearby. Others may choose to stay in lodging in Mount Shasta City. I have stayed at the Mountain Air Lodge and found it resonable with a polite staff. I'm sure other places in the local area are also reasonable. If you plan to stay in a room you should make reservations ahead of time. If you stay in town you should allow about 45 minutes to drive to Bunny Flat and find a parking spot. NB: Once you leave downtown and head up the hill there are no more services - make sure you have everything, including equipment, food, water, and gas! You must fill out a backcountry permit before climbing the mountain. You can self-register at the trailhead (if there are forms left, and don't forget a pen) or, better yet, you can register at the ranger station in in Mount Shasta City (204 West Alma Street, 530-926-4511) before heading "up the hill". Camping is allowed anywhere on the mountain but the two most common areas to camp are Horse Camp and Lake Helen. Some people camp in the Bunny Flat area before heading out on the climb. Where can I buy or rent gear & supplies? Do I need a map and compass? Photo tour from my June 1993 trip. Photos from a June 2004 flyby.